【Comfortable Beech Wood Handle】The ergonomically designed beech wood handle is made in high quality, sturdy & smooth for comfortable grip. 【SK7 Carbon Steel】 Hardness up to HRC65 (hardness comparison: SK7>SK2>SK5). Brand: SIMILK ARTISAN SIMILK Wood Carving Tools Knife Kit comes with 12 different shape sizes, including deep gouge, medium gouge, shallow gouge, narrow straight chisel, wide straight chisel, rounded chisel, 4 angled knives/chisels, parting tool, pinpoint tool, great for beginners whether it's kids or adults. Various 12 shape sizes is widely used in wood working projects, art project, crafts, home repair, linoleum, clay sculpture, soapstone projects and DIY article. Worked well with softwood such as basswood, pine, hickory, poplar wood, perfect for beginners. 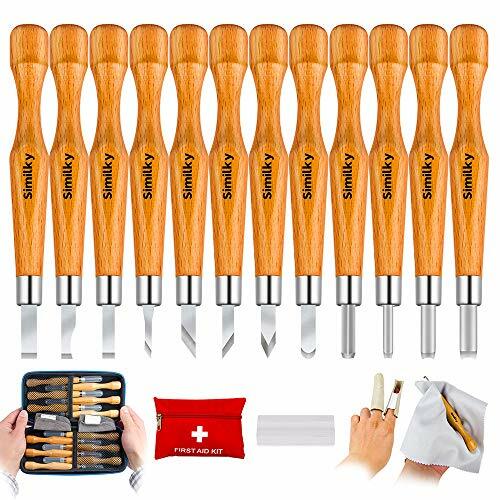 Product Features Handle: American Beech Wood Blade: SK7 Carbon Steel (hardness up to HRC65) Storage Case: Durable Nylon bag Package Included Rectangle Nylon-Made storage zipper bag* 1 Carving Tool * 12 Protective Cover * 12 Attention These tools do not fit very hard wood. Please keep it dry and clean after use, if necessary, give the blade a proper grinding. If this product doesn't meet your expectations in any way, simply call Amazon and ask for a refund. Get FREE Shipping with this is Amazon Prime eligible product. - 100% MONEY BACK GUARANTEE & PRIME SHIPPING. If this product doesn't meet your expectations in any way, simply call Amazon and ask for a refund. Get FREE Shipping with this is a Amazon Prime eligible product. - 【SK7 Carbon Steel】 Hardness up to HRC65 (hardness comparison: SK7>SK2>SK5). High Quality SK7 Carbon Steel with Electrolytic Coating, Razor Sharp Blade, various cutting shapes, good toughness, blade stronger, perfect for soft woods like maple, pine, basswood, poplar wood and pumpkin. It will always be the perfect tool for wood carving, whether you are a beginner or a professional. - 【WHAT WOOD CARVING TOOLS FOR】 The Wood Carving Tools for a beginner whom needs to fall in love with wood carving. These 12 different shape size set is the perfect starter gift.safe and stays sharp enough until the beginner graduates to more professional tools with great value. - 【Extremely Safe】 Every single tool has a stable plastic protective cover to prevent unnecessary scratch and injury. Each pack has durable Nylon-Made storage case for better portability. - 【COMFORTABLE WOOD HANDLES】Woodworking takes patience and time. That's why you need comfortable wood carving tools to work with. These wood sculpting knives have ergonomically design beech wood handles, so they are incredibly comfortable. They're also quite lightweight, so they're easy to control and they won't make your arm and fingers tired. Wood carving is now a breeze, thanks to these wood carving tools.